So you have a tank that is trying the ‘gogogo’ thing or just plain has not asked for CC. There are more than a few ways you can use CC despite him, or try to. Here are a few. There are probably plenty of others. These tips are also useful of you have a tank that wants to CC but the DPS keeps breaking it. Distracting shot is a 6 second forced attack that hunters can use. If you tag a CC’able melee target with it and then drop a trap at your feet, you can pull that target off the tank and trap it. Banish is a ‘lock ability that puts an elemental or demon target in a state where they can’t do anything and they can’t be hit. This is great because you can Banish targets that are in the melee and it will not break accidentally. Deathgrip pulls a target right out of the melee pack. Then you can have a friend trap, repent, sheep, etc. Be careful though, if the target has a DOT on it then it will not stay CC’ed. And Deathgrip is also a taunt – so if the cc doesn’t go off, you will have a very angry mob up close and personal. With Mind Control a priest can take over a target and use its abilities. The controlled target becomes an ‘ally’ for a short time so the CC will not be broken since the target can’t be hit. You can use Typhoon or Thunderstorm to knock targets way from the tank and then CC them. This is risky and disruptive but it can work. Hex is very durable. It resists a lot of damage. It can take a few aoe hits and not break. So you could keep something, even in the melee, CCed for at least a short time. Many forms of CC work when the tank is pulling the group back with a ranged move. Traps, Hex, Sheep, Repent… just about everything except sap. And even sap works if you get in there fast before the pull starts and hit a target the tank is unlikely to hit with the ranged move. This is effective against DKs tanks that tend to use deathgrip for pulling (some do, but not all). As the tank moves in for the pull, the targets aggro and move to meet him. The fight usually takes place about 2 steps in FRONT of where the first target of the pack is standing at the start of the pull. If you preselect a target that is far from where the tank will meet the first opponent, there is a very high chance you can CC it out of range of melee aoe. You can do this even as the pull is happening if you are fast. This can work with a ‘charge’ tank like a bear or warrior, and is very effective with a Pally tank. You may have to do it after a shield throw if you’re worried about the shield breaking your CC. If you have run the instance a few times you should know which targets are casters and will not move toward the tank. Many tanks that are not experienced enough to ask for CC also tend to leave a hanging caster out shooting at the party. If you know which those targets are likely to be you can CC them before they get a cast off. This is very effective with a bear tank because they lack a real ranged silence. You tank will be very thankful even if they did not mark targets properly. Just offer to do it. Some tanks don’t ask for CC, not because they dislike it but just because they are being lazy or forgetful or they don’t like being demanding. Or they may be so new they don’t know what classes can do what kind of CC against which types of targets. If you offer to use CC they will often be glad to let you do it. You might have to pick and announce which targets you are CCing if the tank doesn’t. Many tanks, if you announce what you are going to CC, are happy to let you do it and try to avoid breaking it. It takes time for tanks to get really good at dealing with CC pulls and just CC in general. It takes time for them to learn not to break it. It takes many tries for them to get the hang of the proper sequence of a CC pull. Keep trying. Help your tank learn. If they break it, don’t cuss them out. Remind them what target you are CCing and tell them how they can avoid breaking it. Tanks did not have to learn this stuff in the last expansion. Don’t be shocked if your tank has no idea how to work with your kind of CC. Offer to use it and help them learn how to work with it. Or they might just be so gung-ho that they or lazy they don’t want to CC. If you keep trying they may give in and let you do it. It helps the healer and often keeps you all alive so don’t be afraid to push the issue with a reluctant tank. The lock one is Banish. Shamans have Bind Elemental, which as you know, can be broken. Inexperienced DK tanks may pull with Death Grip … ones who know what they are doing rarely do. It’s far too valuable a tool to be wasted as your first move, especially when Icy Touch has a similar range. I didn’t mean to ‘pull’ with death grip. I meant that it pulls someone away from the tank and can be used to move a target to a place where some sort of CC will not be broken. Like pulling one over to a trap. Oh I know. My comment was more of a warning that if you get a tank that uses death grip to pull, you’re going to have to CC stuff because he probably won’t get it all grouped up nicely around him. If the tank uses it to pull and there is more than one caster, he’s blown his best tool for controlling it (other than having someone CC it, of course). As a tank (albeit one that appreciates CC) I approve of all of these except the knockback. If I’ve done my job as the tank and managed to round up both melee and casters into a tankable position (i.e. one that would require you getting it away from me to effectively CC it) and then you come in and scatter them, it makes me work that much harder to maintain control. All of the other methods listed affect a single target, but Typhoon/Thunderstorm are more indiscriminate and should be used with more caution. Yup. All of the should be used with caution. Knockback might technically be more disruptive…. but a hunter using distracting shot can just as easily fluster a tank and caused them to drop agro on other targets. Anytime you do anything that surprises a tank, even if it is a good thing, you risk them getting stressed and becoming less effective. On the other hand I dont mind knockbacks at all if they are timed well, toward the end of a fight. Did you run something with Sorak? I love to banish elementals all the time on my lock. I love that it doesn’t break on damage, it’s like the trump card to the “are we using CC?” Yes, the lock says we are. Also, right on about CC’ing the one left behind. I just wish more DPS would notice the one off to the side and apply CC. Sometimes as a tank I leave that guy… and wait… and wait… and wait…. the DPS probably think I am a fail tank letting that guy sit out there but I am hoping some huntmagelockshammyretadin might notice and deal with it. If I see them out there I always take notice to sheep or whatever I can! Also, I am not the warlock that doesn’t unbanish to re-engage the mob, if everything else is dead or almost dead, I’ll unbanish to keep things moving. I really, really like the spirit of this post. It’s not rude or confrontational about bad players, but it suggests simple solutions for players to deal with others’ bad playing. Well done! 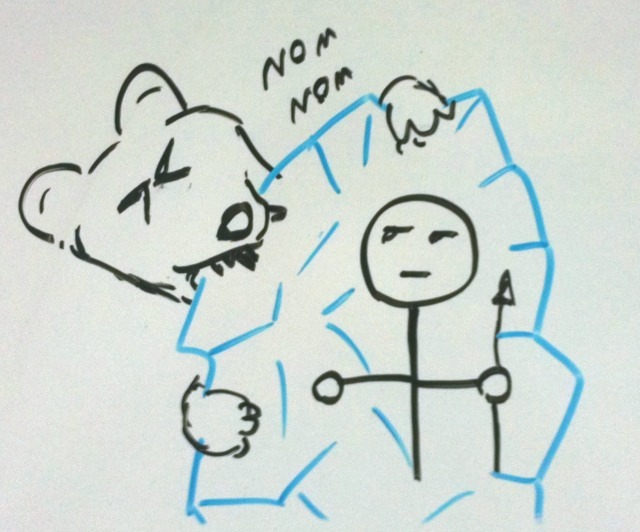 While the information on CC is helpful and appreciated, the picture of the bear nomming the mage popsicle made my day. I actually cheated. That picture is one I did for a post sometime last year. It is one of my favories. I need to do mroe pictures, they spice things up nicely.